A delegation from the Ethiopian Embassy in Beijing participated in the 2nd China International Specialty Coffee Expo from 12 to 17 March in Pu'er City, which is considered the 'coffee capital' of China. The Expo, co-hosted by the Industry Promotion Center of the Ministry of Commerce and Yunnan Province International Coffee Exchange (YICE), is aimed at fostering commercial partnerships among stakeholders of the global coffee industry. It brought together more than 1,000 participants from different corners of the world, including coffee industry experts, producers, roasters, café owners, baristas, importers, exporters, industry associations and government officials. The event focused on the rapidly growing coffee market in China where there has been a recent tectonic shift towards a more upscale coffee drinking culture. Ethiopia, as the ancestral home of the highly desirable Arabica varieties of coffee, is well-positioned to penetrate the specialty coffee market in China. 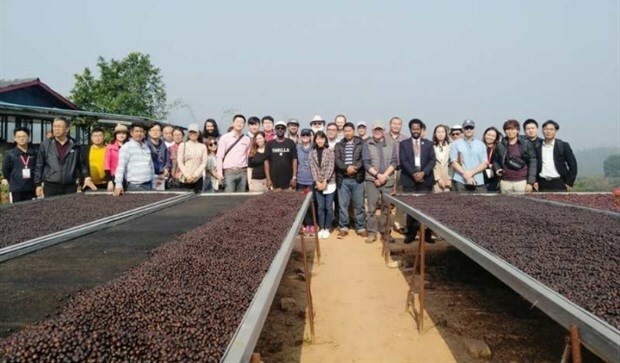 Ethiopia’s participation offered the Chinese coffee community the opportunity to explore its coffee exports and its value-adding processing, and to share in the experience of Ethiopia’s organic, high-quality coffee varieties. China presented a new Trade Facilitation Initiative under the Forum on China Africa Cooperation (FOCAC) last year, which is intended to expand the spectrum of imports from Africa, and among Ethiopia’s value-added and specialty coffee, offering potential for export growth. In its presentation at the Expo, the Ethiopian delegation underlined the long-term efforts of the Government of Ethiopia to improve traceability of coffee beans and transparency for the return to coffee growers. These offer a meaningful contribution to the transformation of the global specialty coffee market. On the sidelines of the event, the Embassy delegation also met with the municipal leadership of the People’s Government of Pu’re City and officials of the Yunnan International Coffee Exchange. They held discussions on ways to cooperate further in developing the specialty coffee market and Ethiopia’s coffee exports.